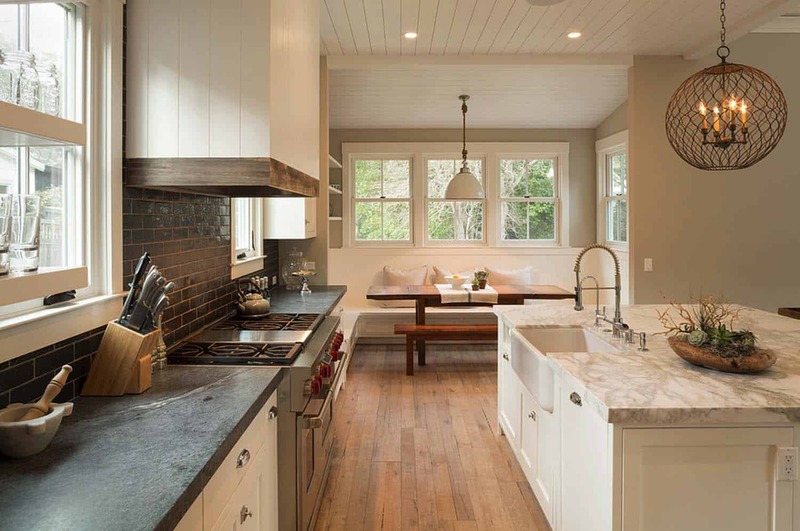 The existing farmhouse style home on this property was in need of a major facelift, Richardson Architects were tasked with completing this project located in Mill Valley, California. The scope of the project involved completely remodeling the home for a family with three young children. 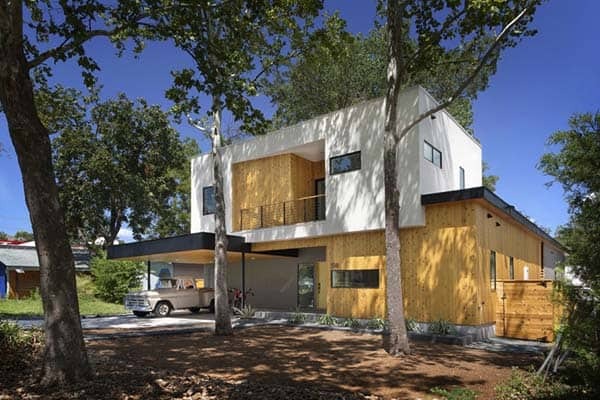 The residence also needed to take full advantage of its flat site, which has a creek at the backside of the property. 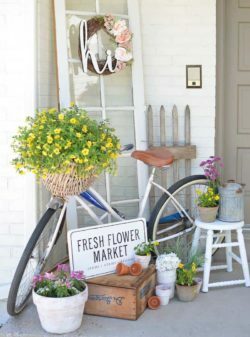 The new homeowners were wishing to update the home with contemporary, stylish interiors that reflect an informal lifestyle. The original home was only a single story. 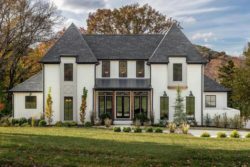 The remodel included a second story addition, now encompassing 4,000 square feet of living space with five bedrooms and four bathrooms. 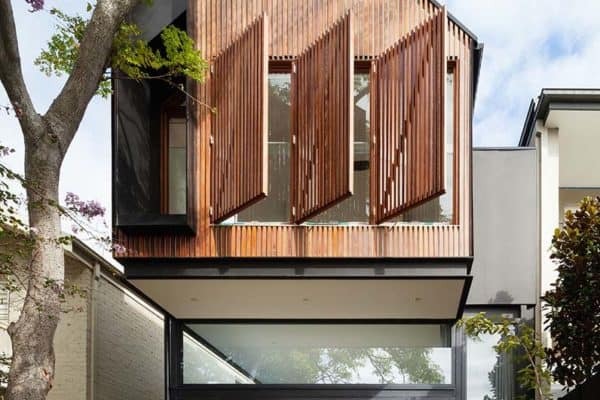 The structure is designed around a central courtyard, an outdoor extension of the main living spaces. It also has become a safe zone for the children to play outside. Additionally, a covered breezeway entry into the courtyard acts as an outdoor play area during inclement weather. 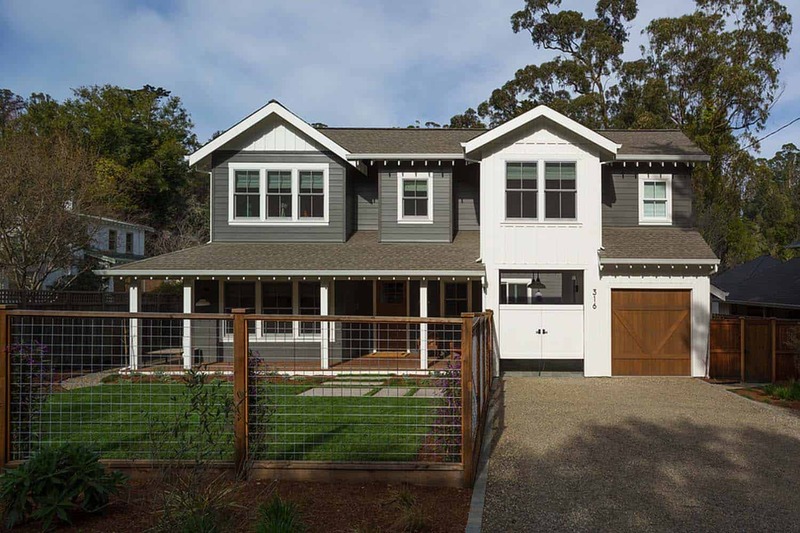 Above: The exterior features a twist on the traditional farmhouse aesthetic, painting the siding in shades of both gray and white. The gray hue is Benjamin Moore Gravestone 1475 (flat) and the white is Benjamin Moore White Dove….. notice the yellow door? 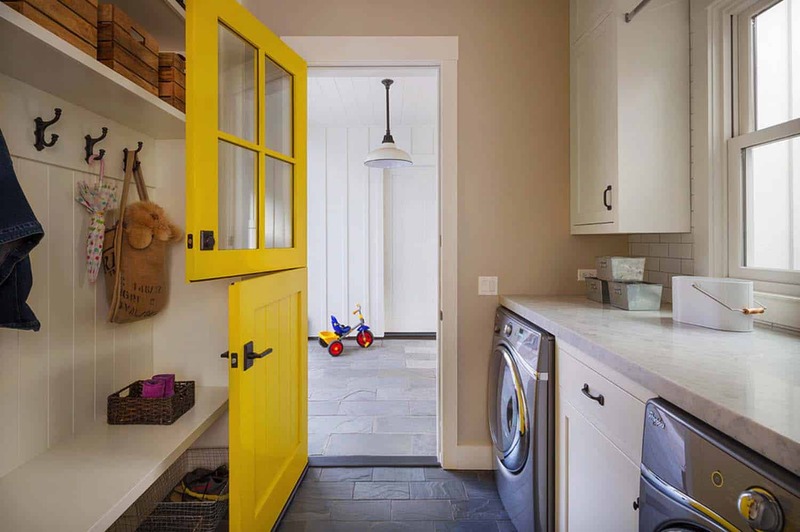 It was selected by the homeowner because she loves the look of a yellow and gray color scheme. 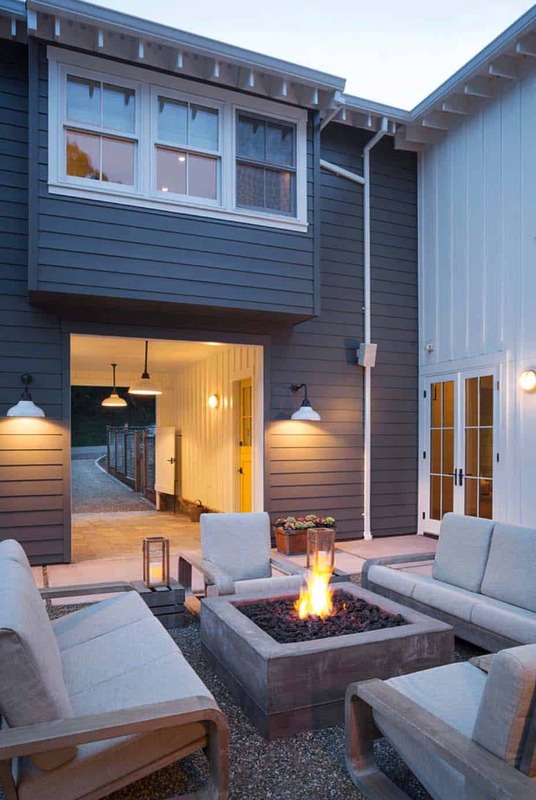 The outdoor furniture was sourced from Restoration Hardware. For the interiors, the architects called upon Postcard Properties for the task. 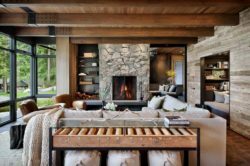 We have featured another house tour of theirs here: Ski lodge blending rustic modern details in Martis Camp. A serene color palette was selected, reflecting soft, quiet shades of gray. 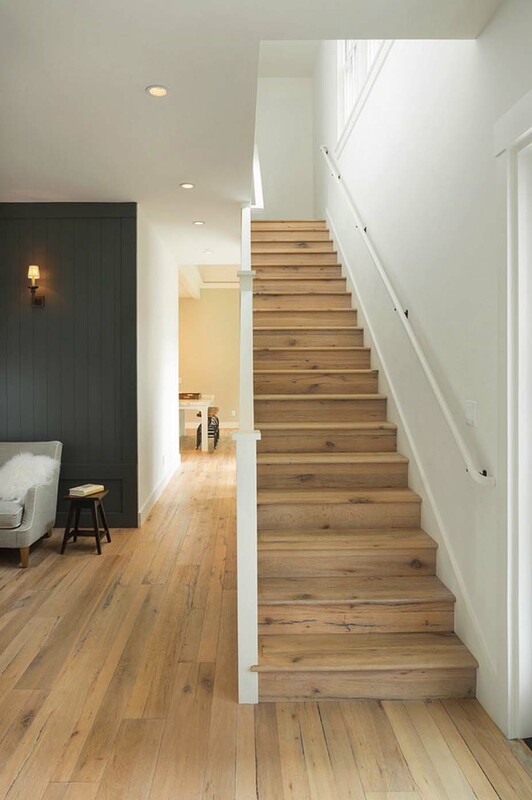 Additionally reclaimed oak flooring throughout gives off a rustic aesthetic; yet due to their light color, it makes the rooms feel light and airy. The flooring material was sourced from DuChateau. Above: The wall color in the media/dining room is Benjamin Moore Revere Pewter HC-172 (flat). The ceiling planks and trimwork are Benjamin Moore White Dove (eggshell). 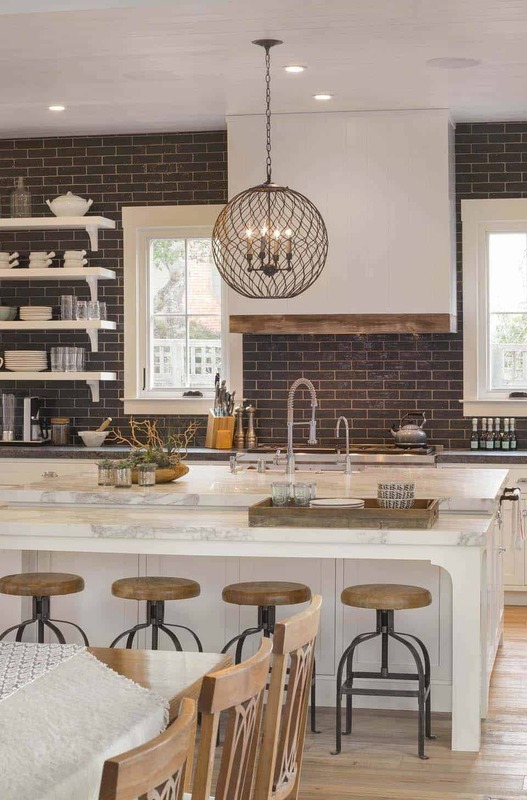 Above: In the kitchen a custom center island features an extended breakfast bar with round wood and metal counter stools sourced from World Market. 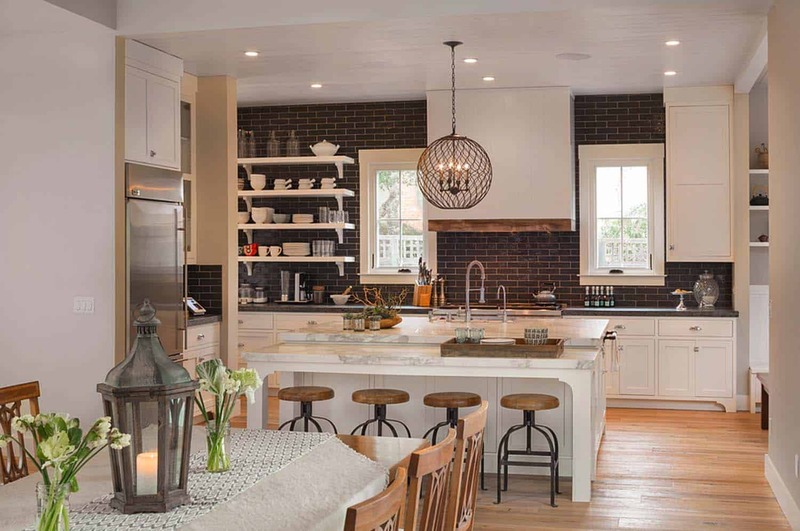 The pendant light fixture suspended over the island is called the Simpatico Orb from Currey & Company (source). 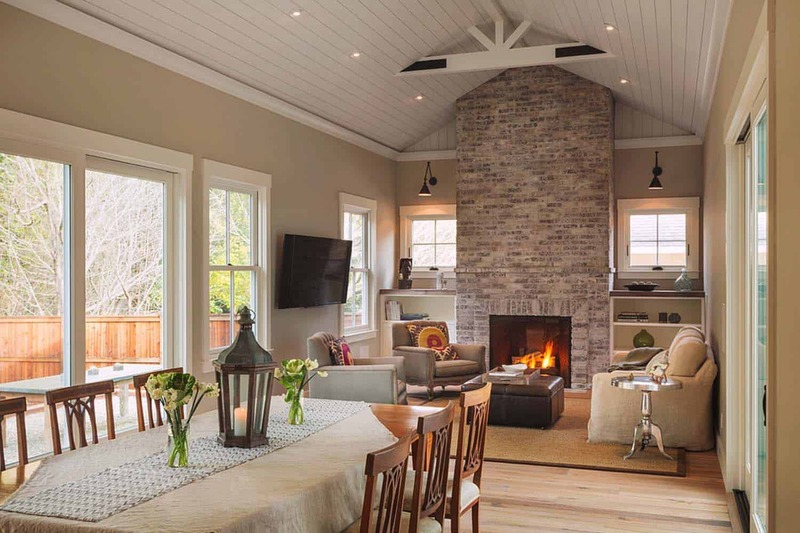 What We Love: This farmhouse style home feels like an incredible family retreat that is full of warmth and a haven of relaxation. The kitchen is especially beautiful, with so many functional features to love… especially for a homeowner who loves to cook! 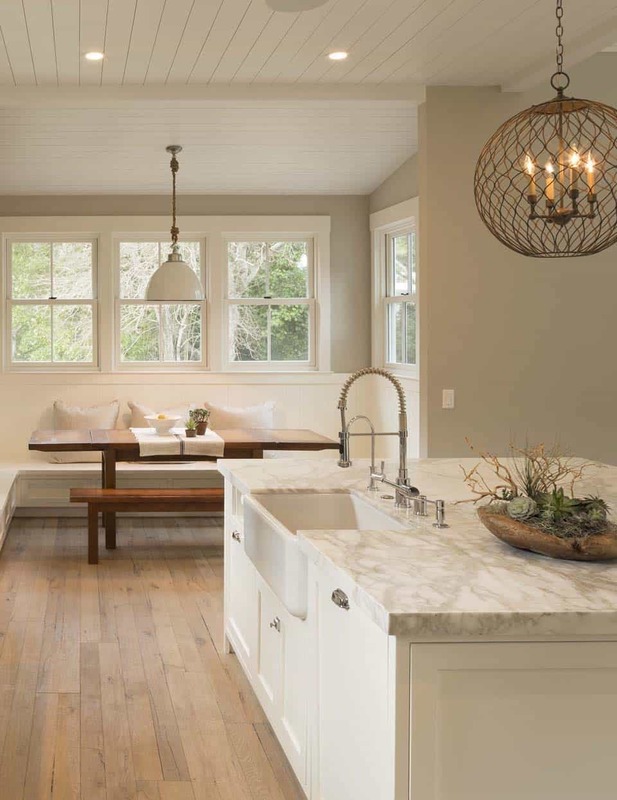 Every detail seems to have been well thought out in the floor plan, with a seamless connection to indoor-outdoor living. 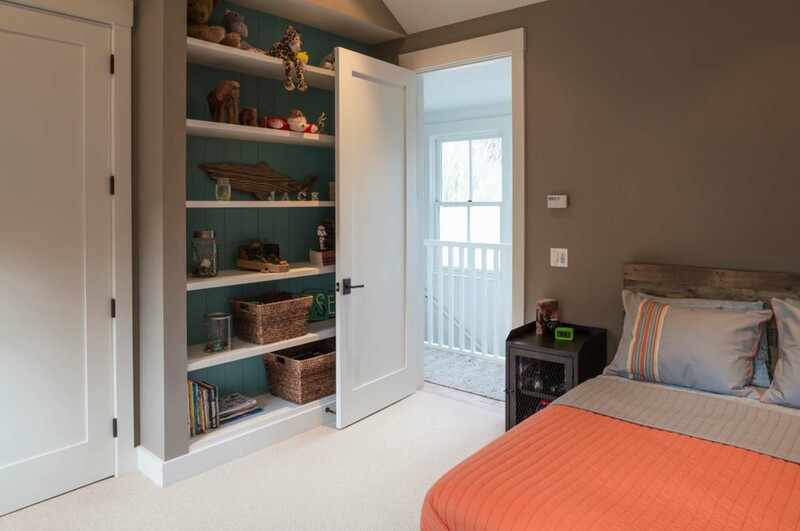 The second level addition was well orchestrated, with a spacious and serene master bedroom and playful children’s bedrooms… what are your thoughts, are you loving the renovation? Above: Here you see a closer perspective of the kitchen and its fantastic amenities… we are referring to the paper towel holder under the counter. It helps to keep your towels handy but tucked neatly out of the way—concealed. Above: Another wonderful amenity that the homeowner requested in her kitchen was that the compost bucket not have to be stored on her counter. 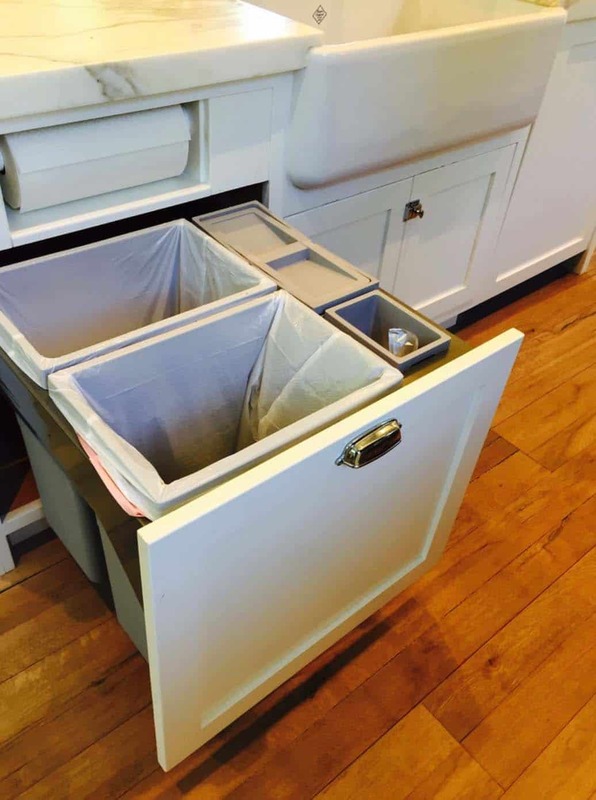 To accommodate for this, a special compartment was integrated into the pullout garbage/recycle bins. Above: This is a lounge space for adults to hang out, read or enjoy a drink. Just off the entryway, this home library features moody walls painted in Kitty Gray by Benjamin Moore. The non-working fireplace is decorated with birch branches. The cowhide rug adds warmth and coziness to the space, purchased from Hudson and Grace in San Francisco. Above: A playroom also plays double duty as a guest room. 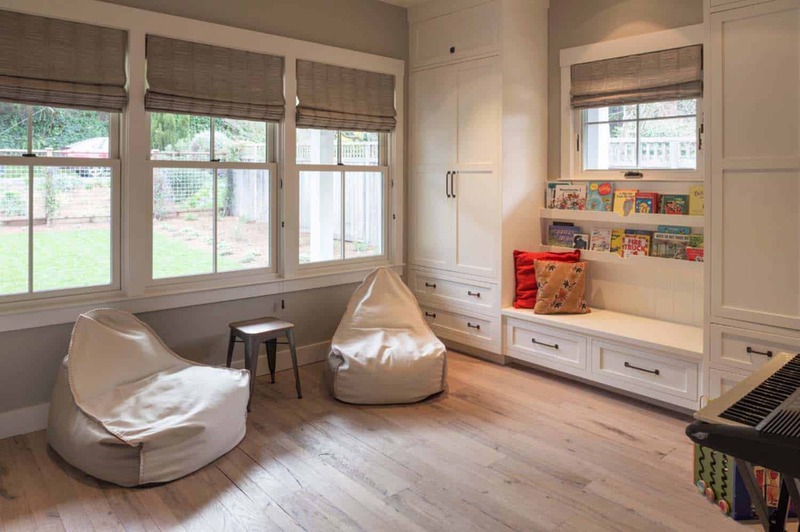 A shelf of books and a built-in reading nook allows the children a space to curl up and read. 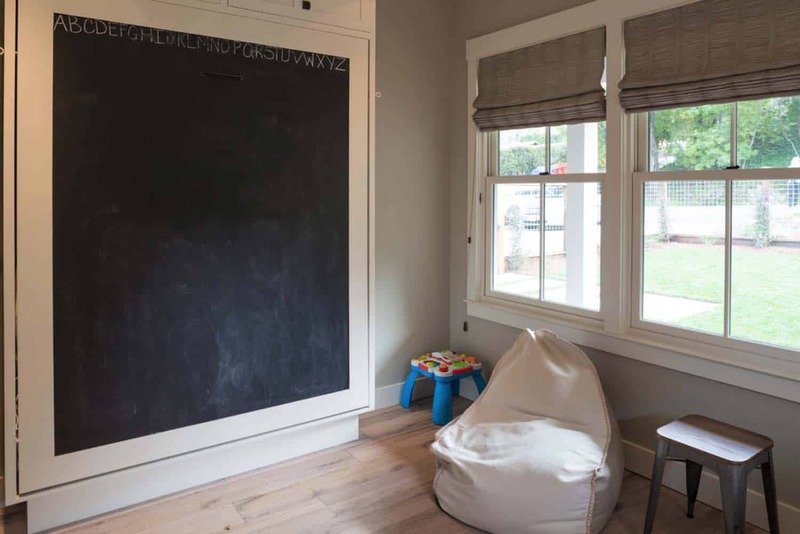 Above: A chalkboard wall appears as a cool spot for the children to draw, yet concealed behind it is a murphy bed. Since both homeowners are originally from elsewhere, their parents like to come to visit the grandkids. When they do, they need a place to sleep… voila, a playroom is converted into a guest room! Above: The bright and airy master bedroom features Benjamin Moore Plymouth Rock 1543 on the walls (flat) and Benjamin Moore White Dove on the ceiling (eggshell). The Colette Bed was sourced from Crate and Barrel. The carpeting is seagrass, adding texture and warmth to the space. 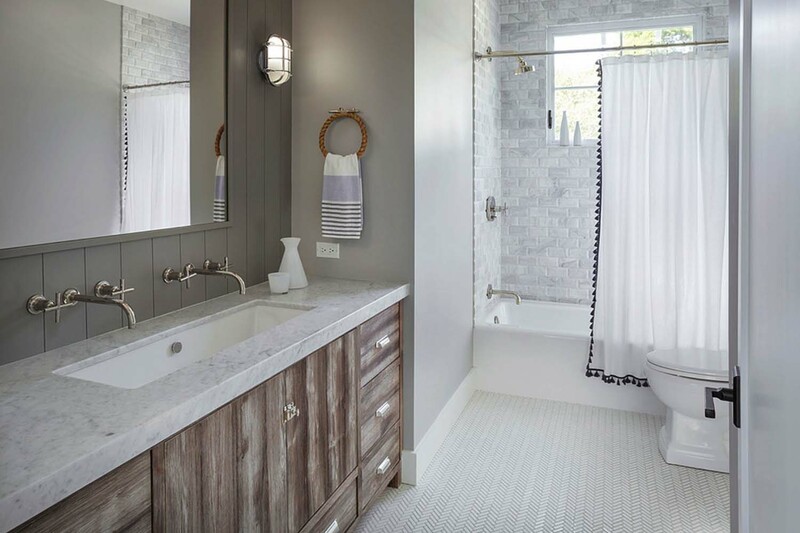 Above: The spa-like master bathroom features a Carrera Marble mosaic flooring. The window treatment was sourced out of a Smith and Noble catalogue; while the serene wall color is Smoke Embers by Benjamin Moore. 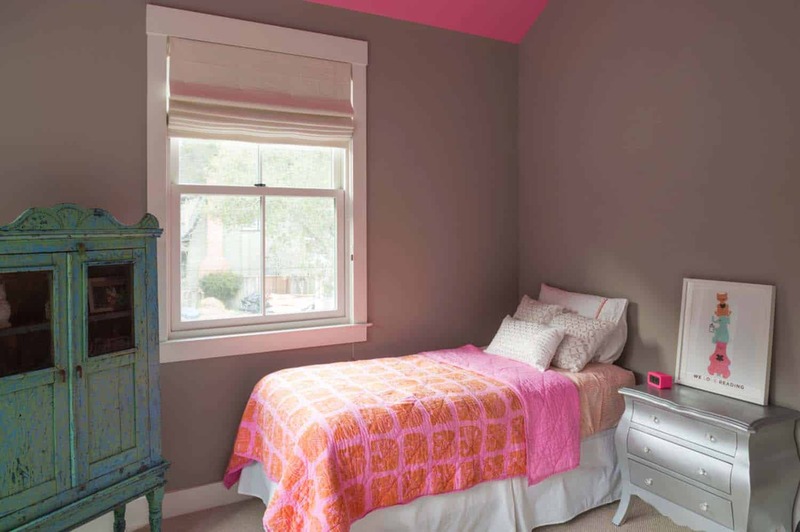 Above: The daughter’s bedroom was painted her favorite color, pink… yet the designer decided to mix it up and apply the hue to the ceiling instead. The wall paint is Benjamin Moore Plymouth Rock, while the ceiling paint is Benjamin Moore Island Sunset. Above: Each of the children’s bedrooms has built-in shelving for books and toys. 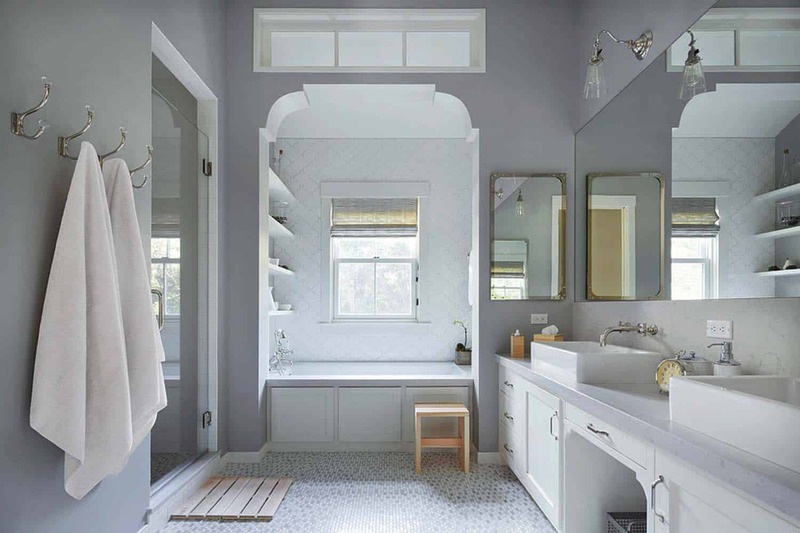 Above: The bathroom is painted in Benjamin Moore’s Smoke Embers 1466 (eggshell); the paneling above the vanity was also painted with Benjamin Moore, in the color Graystone 1466 (flat). 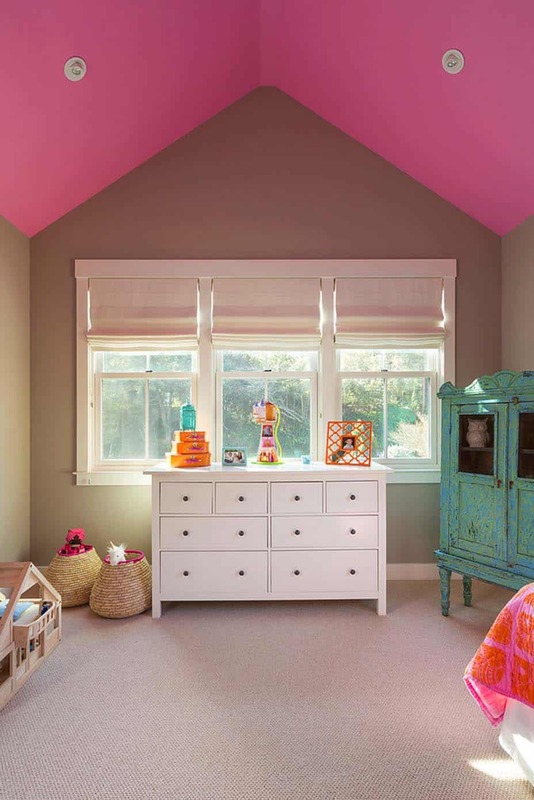 Above: The oldest boy’s room features neutrals with bursts of bright color. The walls are painted in Benjamin Moore Waynesboro Taupe, while the ceiling is painted in Benjamin Moore Seaside Resort. 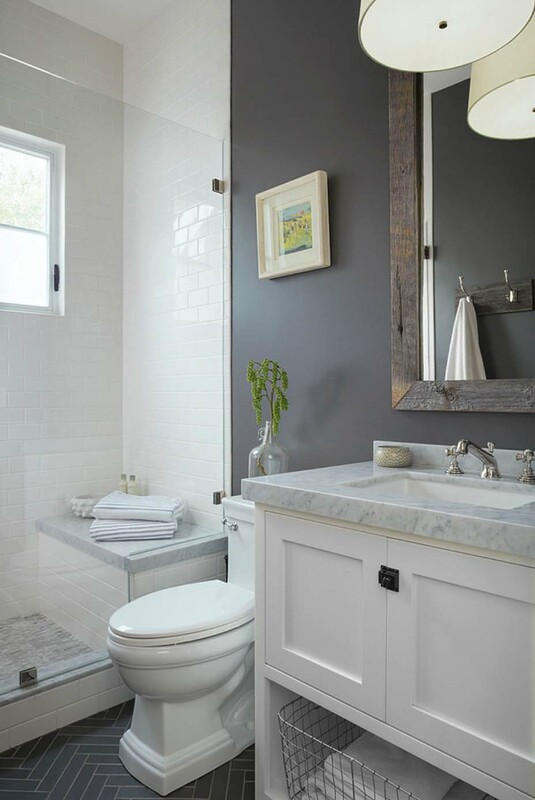 Above: The bathroom flooring is a Gray Herring Bone sourced from Ann Sacks. 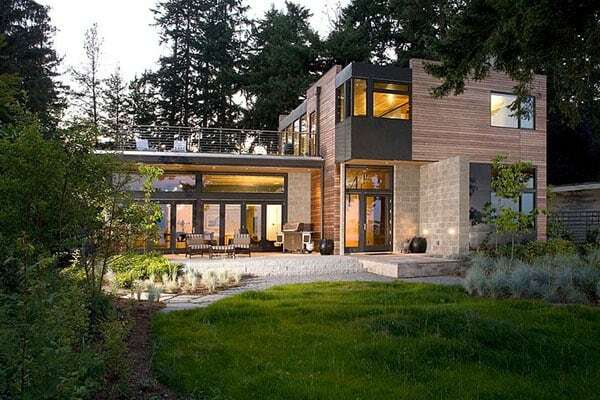 This home is beautiful! I especially love the kitchen. 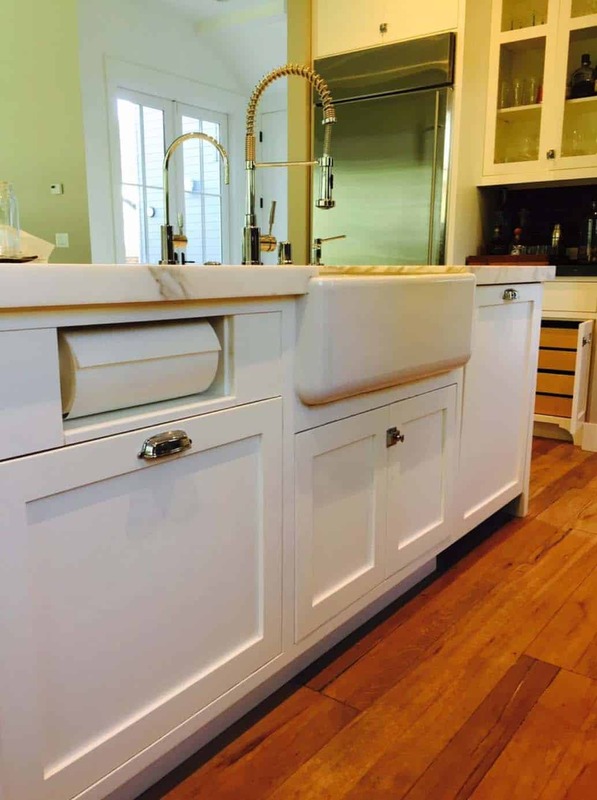 Can you please share what the kitchen countertops are?